The crew of m/s Eira has won the Minute Competition that aims to boost activity among seafarers. Vessel's crew has been successful in the competition organised by Finnish Seamen's Service for many years in the row. The aim of the competition is to help seafarers to exercise in the right way and promote healthier lifestyle. This year already 13 crewmembers from m/s Eira have registered to the competition. Master Niklas Lindroos notes that when most crewmembers exercise it creates an atmosphere which encourages others to exercise as well. The voluntary competition is aimed for all crew members. They collect point for themselves but also for the vessel and for the shipping company. Each minute of activity onboard and ashore is counted and converted to points. You can follow the competition here. 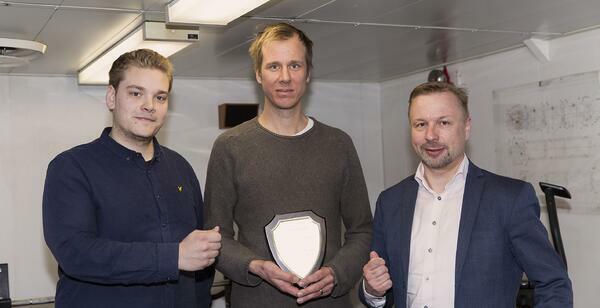 In the picture: Vessel Operator Julius Helkamo handed over the award plaque to the Master Niklas Lindroos. On the right side Sea Personnel Manager Mikko Rausti.